The best way to find hotels in Rome! “Sotto il cielo di Roma” Bed and Breakfast is located in S. Paolo, a central area in Rome. 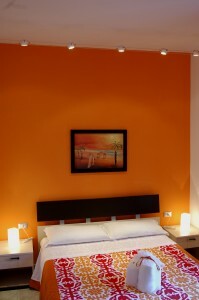 The B&B offers two double rooms, with can also be used as singles or with an added bed for a third person if required. Both rooms are equipped with en-suite bathroom, air-conditioning, possibility internet wi-fi and other options are available to suit your requirements. The recent and complete re-decoration of the B&B, the interior design and attention to details make this vibrant B&B modern and comfortable. In the morning you will be woken up by the unmistakable coffee smell that will be served together with a full home-made continental breakfast that will give you the right energy to enjoy your day. This will allow you to have the most enjoyable stay. “Sotto il cielo di Roma” B&B is situated in a central location, key for sightseeing in Rome. It is situated only 200metres from "Marconi" tube station, one of the two tube lines in Rome, from where you will be able to reach "Circo Massimo" in less than 5 mins (3 stops) and the Coliseum in just 7 mins (5 stops)! 10 mins (7 stops) will be needed to arrive to "Termini", main railway station in Rome, and 15 mins to "Piazza di Spagna" (Spagna’s Square) where there are the magnificent "Trinita’ dei Monti" (Spanish Steps), 20 mins to the Vatican City. In addition to the tube you have the possibility to choose between a wide range of buses that will allow you to reach all corners of Rome just from you door step! At about 200 metres from the B&B there is the “Third University of Rome” and “S. Paolo” Cathedral, one of the four most important and impressive churches of the capital. In addition Leonardo da Vinci Airport (Fiumicino) is located about 19 Km (13 miles) from the B&B and it is easily reachable with the Rome-Fiumicino motorway in about 20 mins or by train in about 40. If you book the room at list 2 nights the price of a double room,private bathroom,air conditioning,tv,internet wi-fi and breakfast is 70 euros per night.